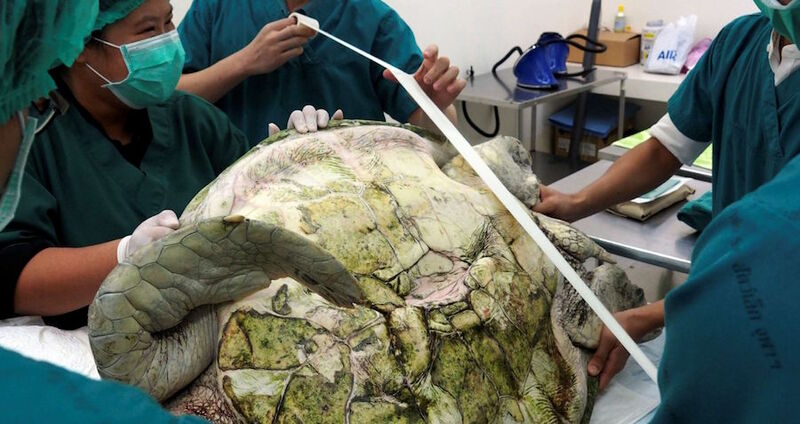 Surgeons removed almost 11 pounds of metal coins from this green sea turtle's stomach. Faculty of Veterinary Science, Chulalongkorn UniversityPiggy Bank the green sea turtle moments before her life-saving surgery. Surgeons have successfully removed nearly 1,000 metal coins from inside “Piggy Bank,” a Thai green sea turtle with a tremendous bellyache. Tourists searching for good fortune fed the 25-year-old sea turtle 915 coins over the course of her life, chucking the money into the pool where she lives in Sri Racha, Thailand. Seven hours and a 4-inch incision later, veterinary surgeons removed 11 pounds worth of coins from inside Piggy Bank’s belly. Some of the coins — many of which were foreign — had been in Piggy Bank’s stomach for such a long time that they were partially deteriorated. “The result is satisfactory. Now it’s up to Piggy Bank how much she can recover,” Pasakorn Briksawan, one of the five surgeons who operated on Piggy Bank, told Fox News. Vets intervened at the right time: Piggy Bank’s coin collection had grown to the point of cracking her shell and triggering a deadly infection. Now, as Piggy recovers, she will be on a liquid diet for the rest of the month. “We think it will take about a month to ensure she will fully recover,” Nantarika Chansue, head of Chulalongkorn University’s veterinary science faculty and the surgery team leader, told the Associated Press. She added that Piggy may need at least six months of physical therapy to become strong enough to leave the Chulalongkorn University’s animal hospital. The veterinarians were able to figure out the cause of Piggy Bank’s stomach woes after 3D scanning the turtle’s insides. The coins, plus two fish hooks, had amalgamated into a giant ball. Fox News reports that the public raised $428 in donations to help pay for Piggy Bank’s surgery, but nobody so far has counted the worth of the coins that used to be in her stomach. Next, check out how the French military is training eagles to take down drones, before finding out about how bumblebees use one specific pitch to make flowers open up.